DEFENDER OF THE FAITH &c.
GREAT and manifold were the blessings, most dread Sovereign, which Almighty God, the Father of all mercies, bestowed upon us the people of England, when first he sent Your Majesty's Royal Person to rule and reign over us. For whereas it was the expectation of many, who wished not well unto our Sion, that upon the setting of that bright Occidental Star, Queen Elizabeth of most happy memory, some thick and palpable clouds of darkness would so have overshadowed this Land, that men should have been in doubt which way they were to walk; and that it should hardly be known, who was to direct the unsettled State; the appearance of Your Majesty, as of the Sun in his strength, instantly dispelled those supposed and surmised mists, and gave unto all that were well affected exceeding cause of comfort; especially when we beheld the Government established in Your Highness, and Your hopeful Seed, by an undoubted Title, and this also accompanied with peace and tranquillity at home and abroad. Then not to suffer this to fall to the ground, but rather to take it up, and to continue it in that state, wherein the famous Predecessor of Your Highness did leave it: nay, to go forward with the confidence and resolution of a Man in maintaining the truth of Christ, and propagating it far and near, is that which hath so bound and firmly knit the hearts of all Your Majesty's loyal and religious people unto You, that Your very name is precious among them: their eye doth behold You with comfort, and they bless You in their hearts, as that sanctified Person, who, under God, is the immediate Author of their true happiness. And this their contentment doth not diminish or decay, but every day increaseth and taketh strength, when they observe, that the zeal of Your Majesty toward the house of God doth not slack or go backward, but is more and more kindled, manifesting itself abroad in the farthest parts of Christendom, by writing in defence of the Truth, (which hath given such a blow unto that Man of Sin, as will not be healed,) and every day at home, by religious and learned discourse, by frequenting the house of God, by hearing the Word preached, by cherishing the Teachers thereof, by caring for the Church, as a most tender and loving nursing Father. And now at last, by the mercy of God, and the continuance of our labours, it being brought unto such a conclusion, as that we have great hopes that the Church of England shall reap good fruit thereby; we hold it our duty to offer it to Your Majesty, not only as to our King and Sovereign, but as to the principal Mover and Author of the work: humbly craving of Your most Sacred Majesty, that since things of this quality have ever been subject to the censures of ill-meaning and discontented persons, it may receive approbation and patronage from so learned and judicious a Prince as Your Highness is, whose allowance and acceptance of our labours shall more honour and encourage us, than all the calumniations and hard interpretations of other men shall dismay us. So that if, on the one side, we shall be traduced by Popish Persons at home or abroad, who therefore will malign us, because we are poor instruments to make God's holy Truth to be yet more and more known unto the people, whom they desire still to keep in ignorance and darkness; or if, on the other side, we shall be maligned by self-conceited Brethren, who run their own ways, and give liking unto nothing, but what is framed by themselves, and hammered on their anvil; we may rest secure, supported within by the truth and innocency of a good conscience, having walked the ways of simplicity and integrity, as before the Lord; and sustained without by the powerful protection of Your Majesty's grace and favour, which will ever give countenance to honest and Christian endeavours against bitter censures and uncharitable imputations. Twenty years of using ...[new] versions [NIV, NASB, etc.] has convinced some evangelical and charismatic "leaders" that Rome is not as bad as Luther, Calvin, Zwingli, and the Anabaptists had been saying for all these years. Second Thessalonians 2:3 warned, "Let no man deceive you by any means: for that day shall not come, except there come a falling away first, and that man of sin be revealed, the son of perdition." The KJV translators capitalize "Man of Sin" in their dedication because they and their predecessors connected this name with the pope. Recent printings of KJVs misrepresent what the translators wrote and no longer capitalize it in the dedication. This is one of the many indications of the "falling away" being evidenced today. The new versions follow the exact same Greek manuscripts the Catholic Church has used since Constantine (A.D. 330). The true church throughout history never used those Alexandrian-type manuscripts (B, Aleph, P75, et al.). They always knew they were corrupt. But now, in these last days of the prophesied "falling away," these manuscripts have been resurrected to prod the fall and finally to usher in the one-world church. Click on the small picture to view the larger photo! 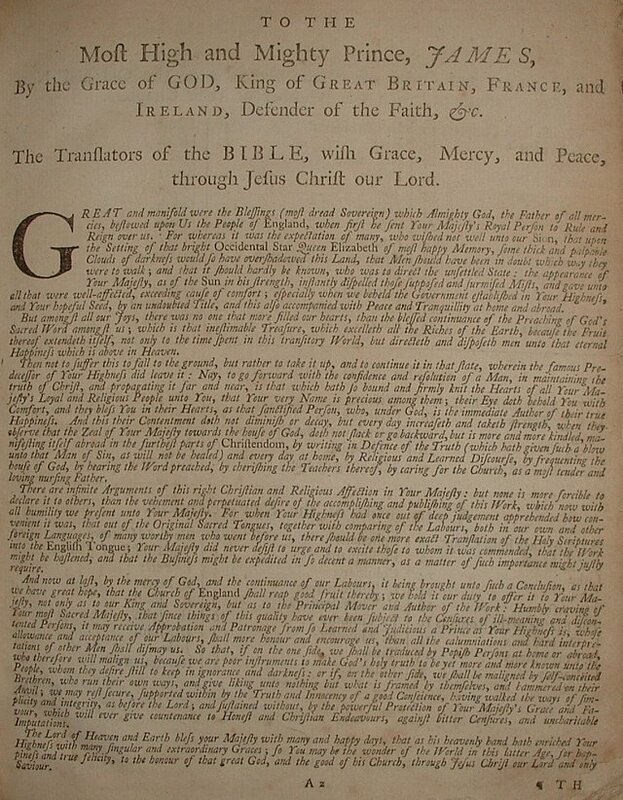 1611 Epistle Dedicatory from a 1761 Edition KJV Bible. Note the capitalization of Man of Sin (2nd sentence of 3rd paragraph).